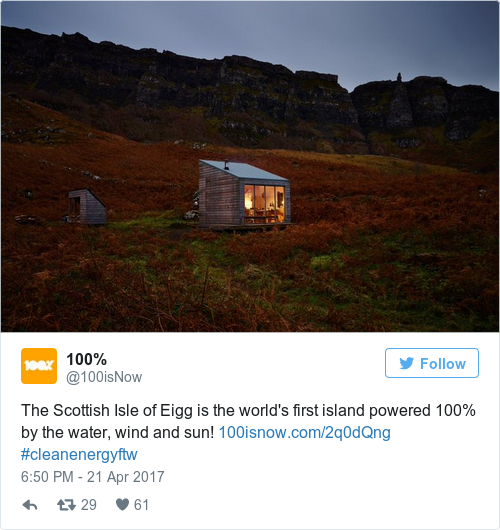 THERE WAS A time when the residents of the Isle of Eigg, under pressure due to eviction notices from their island’s landlord, were uncertain of their future on the island. But with the arrival of a new baby this year, almost 20 years after islanders bought the island for themselves, the tiny island’s future looks secure. “The population crept up on us, without us realising,” says Maggie Fyffe, of the Isle of Eigg Heritage Trust. She says that the population passed 100 a while back, but they didn’t realise it at the time. Now the number hovers around 105 (they’re really not sure). The Isle of Eigg (‘eigg’ means ‘notch’, Maggie says) is one of a group of small islands, including Canna, Rhum and Muck. The history of that group of islands is horrific and fascinating: more than 400 years ago, all 400 resident of Eigg were killed during a clan feud between the island families. In the 1500s, after Eigg islanders hid in a cave for three days, the rival clan from the Isle of Skye found them, blocked the narrow entrance to their hideout with heather and set it alight. All suffocated by smoke and their bodies left in the cave and it was only after a recruitment for families to live on the island in that it was repopulated. Despite the island’s size, (it’s only around 3 by 5 kilometres), they rely on the Scottish mainland for very little. There are a number of businesses on the island in the form of farmers, tradespeople and a new brewery, and everyone is very self sufficient, Maggie explains. Maggie describes the landscape of the island as “very varied and unusual, with beautiful beaches, moorlands, and a big lump of rock in the middle”. It’s a brilliant place for wildlife, and for birds in particular. I haven’t spotted them all yet! They’re also prepared for elections: with their own polling station and a boat that comes in to take away the ballot box shortly after polls close. Maggie’s lived on the island for 40 years, and although the decision to move onto the island was straightforward, the tempestuous relationship with the island’s owners threatened the peaceful community. In May 1992, Eigg was officially put on the open market and when Keith Schellenberg, who already owned half the island, bought the other half from his ex-wife. Our local newspaper carried the headline “Paradise Lost – Eigg is back in the hands of Emperor Schellenberg”. Tension had been building up between residents and Schellenberg after eviction notices were sent out and a number of island residents were made redundant. Residents met and formed the Isle of Eigg Trust and agreed on a plan of action. In March 1995, after months of speculation, islanders learnt from the press that Eigg had “been sold” for £1.6 million to a mysterious German artist who called himself Maruma. In October of that year it was revealed that Maruma was being investigated by the public prosecutor in Stuttgart regarding irregularities in a £1.6 million loan from a German bank shortly after buying Eigg. Tired of all the uncertainty brought by their owners, Eigg’s residents took matters into their own hands. With the island up for sale again, they appealed to the public to donate funds allowing them to buy the island for themselves. It was at least four hours later before I managed to get off the phone and drink a toast to the future! And that future includes more new faces. A really talented graphic designer, who built his own drone called Picarous. The businesswoman who runs Annie Knitwear, creating beautiful knitted pieces. A man who owns a record label, and has set up a festival for the island called the Howlin’ Fling. One guy arrived to the island in a kayak and never went back. Very soon after I first arrived on the island, it just felt totally like home, I don’t know why. When people who lived on the island start having kids of their own, they come home to Eigg. There’s a freedom here that isn’t in other places. Maggie’s son-in-law and another young man have recently set up a brewery on the island, Laig Bay Brewing, which she says will be fun. I wonder how they’ve lasted this long without one. Email “A newborn baby pushes a tiny, fascinating Scottish island's population to 105 (we think)”. Feedback on “A newborn baby pushes a tiny, fascinating Scottish island's population to 105 (we think)”.